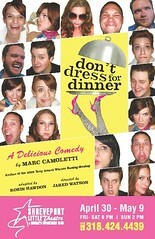 SLT's comedy, Don't Dress for Dinner, runs Ap 30 to May 9. A duet titled "Whispering turmoil"
The Artbreak festival engages more than 100 schools, includes more than 50 hands-on art activities, features 100 school and community performances, and exhibits more than 3,000 works of art by students, says Pam Atchison. Highlights of this year's Artbreak festival include the Very Special Arts Festival, Robotics Showcase, the Superintendents' Performing Arts Showcases, the Art of Fashion Design, and more than 50 hands-on arts activities. The hands-on art activity booths will be open each day as follows: April 30, 4 to 8 p.m.; May 1, 10 a.m. to 8 p.m.; and May 2, noon to 5 p.m.
Sci-Port will be on hand May 1 with their "Space Journeys Science Carnival," where families can engage in life in space. Admission to ArtBreak is free. There is plenty of free parking surrounding the Shreveport Convention Center and there will be a free "Yellow Bus Trolley" transporting festival-goers from the Municipal Auditorium parking lot to Shreveport Convention Center. Parking in the Convention Center garage is also a good idea; it's $5. The Shreveport Convention Center will provide concession booths with special "kid friendly" menus and pricing. Paintings by Jasmine C Morelock have been on display at the Women's Department Club, and will stay on display until April 30. The artist will complete her show with a hello to friends this week. "I will be at the Woman's Department Club on Wed and Thurs, Ap 28 and 29, from 9 am to noon," she said. Morelock was one of Shreveport's intrepid abstract artists of the 1950's. Alongside Jerry Wray and Clyde Connell, Morelock painted, sculpted and worked in mixed media at a time when Louisiana artists following the abstract expressionists of NYC were small in number. She may be best known as illustrator of the cover of Goodloe Stuck's book, Shreveport Madam. Yet she has explored a range of formats and subject matter in her paintings. See Margaret Martin's terrific description of Morelock's career at The Times. This exhibit is hardly Morelock's swan song. Her next project is to display her work on a proper web site. You are invited to “Trampin’ in the Park”, Sat, May 1 @ 4pm in Veteran’s Park, says Cynthia Keith. 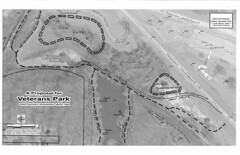 Meet at the dog park banner in Veteran’s Park, across from the parking lot of the Frisbee golf course on Clyde Fant Pkwy. Join us as we tour Veteran’s Park. Relive past memories as we visit the amphitheater in the upper portion, learn about a new find in the hills, hear A Better Shreveport tell of their pedestrian and bike trails in the area and dog park updates. We’ll travel down to the lower part for some tunes played by some that actually played in the park decades ago, along with some that wished they had. We hope to have Dan Garner, Barbara Jarrell, John Howe, Amelia Blake, Loren Demerath, Fiddle Master-John Peck, Ron Cosby on the dobro, and Chuck Fulco on his harmonica jammin’ as we sing along and picnic. Wine and cheese provided (shhhh, keep that part a secret). 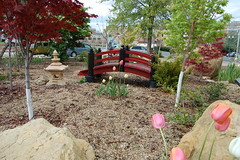 Bring a chair or blanket, something to munch on, and sit under the trees and enjoy an hour or two with us. "Friday night, AJ & the Two Tone Blues Band will be playing upstairs in the Windows on the Lake Dining Room," says Jayne Lanza. "It will be a great night for those who love to dance come out and have a great time enjoying good music and Louisiana Cuisine. Saturday night, we have a special appearance with Steve Howell. I am sure you have heard that Steve's latest CD has received great reviews. Dave Hoffpuir on drums and Jim Malsch, on bass will be joining Steve. I love Steve's music as it is always a perfect touch for enjoying a relaxing evening out." 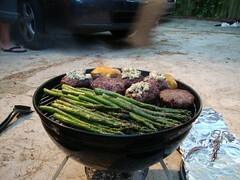 318 631 0919: reservations recommended. Earth Day: could Shreveport care less? At least Sci-Port: Louisiana’s Science Center, will explore recycling and alternative energies — with free solar-cooked hot dogs as one example -- during its Earth Day Celebration on Saturday, April 24, from 11 a.m. to 4 p.m.
* Solar Hot Dogs - 11:30 a.m. to 1 p.m. Weather permitting and while supplies last, visitors will prepare hot dogs on a solar-powered cooker. * Paper Recycling - 11:30 a.m. & 2:30 p.m. Visitors will make new paper from blending wasted paper scraps. * Wind Farm Challenge - 11:30 a.m. & 2:30 p.m. Visitors of all ages will make and test their own mini wind mills. * Solar Cars - 12:30 p.m. & 3:30 p.m. Visitors will build solar cars using kits available at Sci-Port. * Recycled Paper Pots - 12:30 p.m. & 3:30 p.m.
Paper items will be converted into pots perfect for growing plants. * Rainforest Game - 1 p.m. & 3 p.m.
An interactive game that teaches the importance of rainforests to our planets. * Talkin’ Trash - 2 p.m. & 4 p.m.
An examination of trash found in a landfill. All activities are included with regular admission and free to Sci-Port members. Shreveportitis says, "Why worry about the future and the idea of planning and dreaming? Nothing will come of it." That, of course, is a self-defeating attitude. - I've met people who care deeply about Shreveport's future and who refuse to be inhibited by the naysayers. - I've met a cross-section of citizens: people representing West Shreveport and North Shreveport as well as East Shreveport. A lot of the participants are newcomers but there are also old guard people like myself. - I've had my attitude improved and bank of ideas enriched by listening to my neighbors. The city is paying a company called Goody Clancy a lot of money to hold meetings and help us shape our thoughts. It behooves us Not to waste that investment. All the meetings below are identical in content and format so choose the one that is most convenient for you, says Goody Clancy. 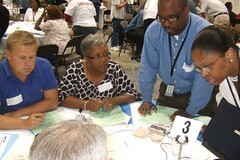 Updates on the Scenario Public Meetings: the Shreveport-Caddo Master Plan website www.shreveportcaddomasterplan.com. 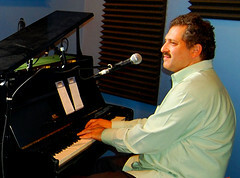 Highlights from Piano Night 2009, produced by WWOZ-FM and recorded live in 2009 by WWOZ at the House of Blues in New Orleans, airs on Red River Radio on Fri, Ap 23, 9 pm. This show features music from two stages: Piano Heaven, a small stage in the HOB Parish room with solo piano, and the Main Stage, with an all-star backing band. It includes performances by Henry Gray, Dan Dyer, John "Papa" Gros, Tom McDermott, Matt Lemmler, John Autin, David Reis, Jim Hession and David Torkanowsky. The Bossier Arts Council's Kelly Warner says of the Artini Art Auction: "We're doing it Online! The Ebay auction opens Wed, April 21 and runs through Tues, April 27. 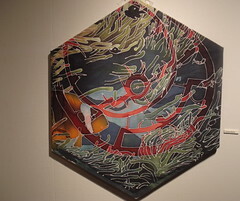 Artwork can be viewed at the Bossier Arts Council East Bank Gallery during business hours And on Saturday, 11am - 3pm. We will have a reception for the artists this Saturday from 1-3pm. Please stop by to see the art in person - and meet the artists - and bid, bid, bid! We will keep the bidding open through the following Tuesday." 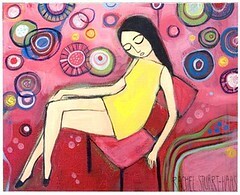 Illustration is a piece by artist Rachel Stuart-Haas; a similar one is available in the auction. "The Collective began in 2010 as a group of independent musicians, artists and business people sharing ideas, resources and a love of music," says the well-crafted web site for the latest venue in Shreveport, The Collective. "We work closely with a select roster of artists we love, respect and call our friends. Our goal is to create a friendly and productive environment for these people to make music." More from their site . . .
- We have a 300 capacity entertainment venue inside the collective. We provide live entertainment on a weekly basis. Check out our calendar for upcoming events (index.php?option=com_content view=article id=59 Itemid=70)!! - The Collective has 7 rehearsal rooms available with 24 hour access. Our facilities also include a lounge area with full kitchen, and a lodging room with bunk beds for those real late night practices before a gig. We are officially announcing our first listening party of our singer/songwriter showcase series. This event will showcase some of the singers & songwriters in Shreveport, LA. Volume one of this showcase series will feature AJ Haynes, Jasper McAdams, AJ Lowring, & Dakota Rambin. It will start on Saturday April 24th @ 8pm. $5 cover. 1262 Dalzell St, between I-49 and Linwood. The Collective lists as Loyal Staff a quartet of music mavens: David Goldsmith, Cameron Goldsmith, Michael Stephens and Krystal Plunkett. An unexpected gig has arisen for Nathan Woods and band, Romulus Remus, at Noble Savage. 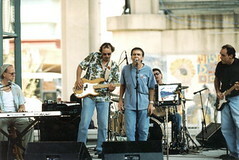 Woods will open with the group, do a middle section solo and close with the band on Wed, Ap 21, beginning at 6:30 pm. Hear parts of the new Romulus Remus album, Good Grief, at myspace.com/romulusremusmusic. Charles Madden, an award-winning artist who has developed his skills through assiduous attention to his teachers at Renzi Center and Caddo Magnet High, writes that "I am putting together an art show as a fundraiser for the American Cancer Society. 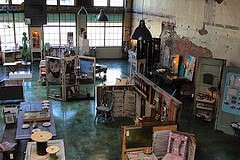 It will be a two week art show starting May 22 from 1-4 pm at Artspace downtown and it will run through June 5. The artwork in the show will be sold via silent auction. 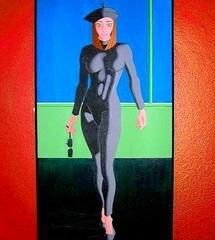 All art work donations are of course tax deductible." Madden adds, "I'm in need of more artists so that the show can be a success, and I was wondering if you would be able to donate a drawing or two of yours. There is no specific theme, but if you need inspiration, think Hope, Celebration, Victory. Anything will be a great addition. Please let me know what help you can provide. Since I am not well known, I've had a bit of trouble getting in contact with artists, so any help you can give will be great." Neoteric Art: You live and work in Louisiana. Do your surroundings influence your work? ES: I am not sure, maybe the light and the trees. I don’t think you can see that so much in my work but that is what interests me visually in this environment. My work is about an internal vision, emotions, memories that get processed on a subconscious level and than find a life in the forms and colors that I use. Sometimes I am so close to what I am doing that it does take a while for me to see what was an obvious influence. 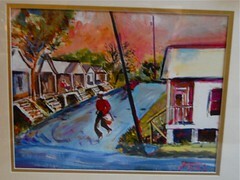 Living in Louisiana has an influence because I think that where you live has to affect your painting. Living here as an adult I feel more connected to the people in my life than the place. When I was growing up in Philadelphia I really did feel connected to the place, the buildings, people, the rhythm of life in that city. When I go back to Philadelphia now I notice the light quality is different. That is something that I would not have noticed if I had stayed there. Marjorie Kouns has lived in Greenwich Village for decades but has used her public art concepts to install fun projects in Asia and Europe as well as the US. The project she has erected in the 700 block of Texas St, Shades of Shreveport, is one that originated in a Times Square work and metamorphosed into a Washington Square Park event. 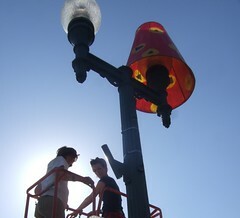 She has installed very large lamp shades over the street lamps to bring a fresh vibe and an air of coziness to the city. Thus, Ap 15, the twenty shades she schlepped to Shreveport will be in place. 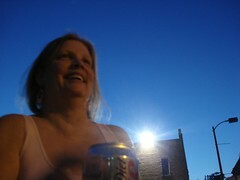 A reception opens at 5 pm and she gives an artist talk at 6:30 pm, but it will near 8 pm before the shades rock. When the street lights come on the project reaches its full impact. Also bringing life to Texas St on Thurs eve is the Downtown Pub & Culture Crawl, 5 pm to 9 pm. 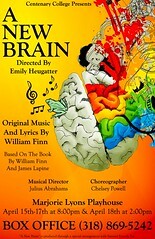 "It's a wacky story about hope and love," says Erik Champney of the musical A New Brain, which opens a 4-performance run at Marjorie Lyons Playhouse on Th, Ap 15, 7:30 pm. The video was shot at a rehearsal last week. LSU Shreveport Animation and Visual Effects program will host an event featuring author, illustrator and filmmaker William Joyce. The event will be on April 21, 2010 at 6:30 p.m. in the University Center Theatre, says John Miralles. Joyce will present a behind the scenes look at the concept art of Blue Sky Studios and Twentieth Century Fox’s film, “Robots,” followed by a free screening of the film. Joyce‘s work can be seen in Disney/Pixar's “Toy Story,” “A Bug's Life,” “Meet the Robinsons,” “Mr. Magorium's Wonder Emporium” and the future 2012 film, “The Guardians,” which is based on an upcoming series of picture books. 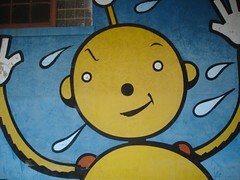 Joyce has received three Emmys for “Rolie Polie Olie,” an animated series based on his series of children's books. For more information contact the Animation and Visual Effects program at 318-795-2480 or email avei@lsus.edu. Complementing the Second Northwest Louisiana Artists’ Triennial Competition at the Meadows Museum of Art, two Northwest Louisiana poets will be reading from their work. The featured poets on Sunday, April 18, are Dorie LaRue and David Havird, says Diane DuFilho. The readings will take place in the museum galleries from 2:00-3:00, with book signings and refreshments from 3:00-4:00. Dorie LaRue holds a PhD from the University of Louisiana and teaches at LSU-Shreveport. Her debut novel, Resurrecting Virgil (The Backwaters Press), won the Omaha Prize for Fiction in 2000. Her poetry collections include The Private Frenzy (University of Nebraska Press) and Seeking the Monsters (New Spirit Press). She is a recipient of a Louisiana Division of the Arts Fellowship, a Shreveport Regional Arts Council Fellowship, and four grants from the Louisiana Endowment for the Humanities. LaRue’s work has appeared in many journals including The Southern Review, The American Poetry Review, and The Massachusetts Review. 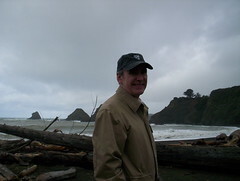 David Havird earned his PhD at the University of Virginia and has been a member of the English faculty at Centenary College of Louisiana since 1988. Here he originated the John William Corrington Award for Literary Excellence, whose inaugural recipient was Eudora Welty in 1991. The author of articles on such Southern authors as James Dickey, Flannery O'Connor, Elizabeth Spencer, and Allen Tate, Havird has also published poems in such periodicals as Agni, The New Yorker, Poetry, the Sewanee Review, Southwest Review, and the Yale Review and online at Poetry Daily. His collection, Penelope's Design (Texas Review Press), was the 2009 winner of the Robert Phillips Poetry Chapbook Prize. Dancing medical walkers? A tango performed around a hospital bed? An overbearing mother and a belligerent frog? What's going on here? Welcome to the celebrated musical A New Brain, where anything can happen and anything often does, says Erik Champney. An endearing but cynical composer, Gordon Schwinn is trapped in a dead end job writing songs for a childrens television show starring a man dressed in a frog suit. About ready to give up on his whole life, Gordon collapses while lunching with his agent Rhoda. In the hospital it is learned that he has an Arterial Venous Malformation (AVM), an abnormal connection between veins and arteries. A life-threatening brain surgery is required. 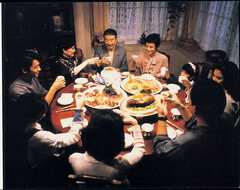 With his lover Roger and mother Mimi at his side, Gordon alternates realities between hallucinations and moments of clarity. His greatest fear is dying with his best songs still inside of him; and so from his hospital bed, and while in a coma, he begins to imagine them coming to life. Musical direction by Julius Abrahams. 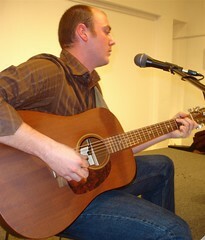 Boston poet Chad Parenteau will entertain during Poet's Nite Out on Thurs. April 8, 7pm -9pm at The Naked Bean Cafe,' says Joanna Ballard. Parenteau has an MFA from Emerson College in Boston. 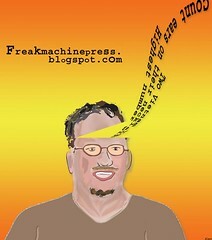 He won a 2003 Cambridge Poetry Award for his chapbook "Self-Portrait In Fire". Parenteau’s poetry appears in numerous print and online publications, including anthologies such as French Connections: A Gathering of Franco-American Poets. Chad has been featured in several venues, including Spoken Word Nantucket, the Fox Chase Reading Series in Philadelphia, the 17 Poets! Reading Series in New Orleans, and the Out of The Blue Art Gallery in Cambridge, Massachusetts, where he is the current host and organizer of Stone Soup Poetry, one of the longest-running weekly poetry venues in the state. Poet's Nite out is an All Age Open mic (including singer/songwriter's) Held the 2nd and 4th Thursday of every month at The Naked Bean Cafe' a locally owned and operated business at 3307 Line Ave., Shreveport, LA 318.864.2999. A selected schedule of regional music from the witty Bruce Flett . . .
Silent Auction, great food, all sorts of fun stuff. Dress like a Cowboy. Special thanks to 'Mike' who called AAA and had them open Bruce's van in downtown Marshall at midnite in the Square. Two weeks in a row Goony 'Birds have locked their keys in their vehicle at the gig. Next time call AA? Is the Governor really shutting down LSU-Shreveport? That would be a travesty. *Music Reigns All Over U.S. But not in China, they banned Bob Dylan! "Volunteers from the Highland Restoration Association are participating in the Great American Clean-Up Saturday, April 10, by picking up litter and other debris in the neighborhood," says Dan Marcalus. "Join us in this effort! Meet at the Highland Center parking lot on Olive St at Highland Ave at 8:00 am. We will work until until 11:00 am, and lunch will be provided to those who help all morning." 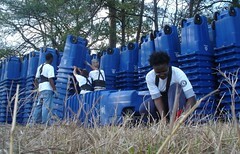 The Highland event is part of the Great American Clean Up being run city-wide, adds Marcalus. "In the early 1970's I was photographing black men in my neighborhood for my paintings. I got real involved with them and recorded them while they told their stories," says Travis Whitfield, a landscape and portrait painter of wide renown based in Keachi, Louisiana (once we spelled it Keachie). From those 35 mm photos and recordings he has fashioned an installation called Travis Whitfield: Further on Down the Road. Alas, his recent exhibition of that assemblage in Houston has finished its 4-month run at Project Row House, an art center in the Third Ward. But he is in negotiations for a site that will allow Further on Down the Road to be seen and heard in Shreveport. 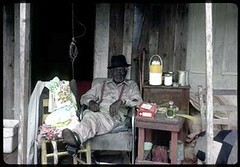 About the life of rural Black Americans in the early 70's he remarked, "It is now a distant time and place." See his photos at traviswhitfieldart.com. He says the photos are selling surprisingly well. The ASEANA Foundation is pleased to announce that we will be having our 3rd Annual ASEANA Spring Festival this coming Saturday, April 10, 2010 from 3:00PM to 9:30 PM at The Asian Gardens, says Mary Grace De Joya Vea. 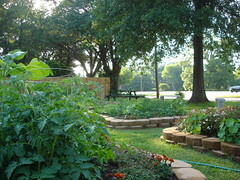 The gardens are at the corner of Milam and Common Street in Downtown Shreveport. Our theme for this year is “Spring Time in Kyoto, Japan”. "We will have a walk-through Japanese Garden complete with cherry blossoms along the path, bonsai exhibit and a Japanese Tea Room. A Lion Dance, kung fu and tai chi will be setting the pace for the Japanese festival. Food demonstrations include: Japanese Yakitori making, Sushi making, Chinese Dumpling making, and Eggrolls making presentation. Ark-La-Tex Gem and Mineral Society will present cabochon jewelry making demonstration. The Suzuki Music School and the Caddo Magnet High School String Quartet will also perform. Tanko Bushi, a Japanese dance will be done by the Portbelly Project and a Greek line dance will be presented by the Gems of Cairo. The winners of the Asian Gardens Photo Contest will also be announced," Added Joya De Vea. A free karaoke singing hosted by Tom Pace will precede the free movie showing of “Memoirs of a Geisha” (P-13). The free movie and free popcorn will be provided by the Shreveport Public Assembly and Recreation (SPAR). Please see the attached program schedule and the list of participants and performers. We do hope you and your family and friends will be able to join us in this festival. Should you need further information, please feel free to email or call (318) 401-8078. "Artspace is hosting a new series called ARTHOUSE," says Megan Porter (Megan Clark until her recent marriage to Josh Porter). "It will take place on the first Thursday evening of each month. Every month we will showcase different local performers of all kinds. This month we are looking for local poets who would like to perform their work at a one-night-only poetry night, as part of the ARTHOUSE series." SRAC's 50 years of Bubble Wrap call to artists includes artwork but extends the call to sculptural installations, fashion, kitsch, jewelry and accessories, and culinary art as well. a. Size: There are no minimum or maximum size constraints. However, the installation or artwork must be able to fit through the double doors. There is no “roll up door” at artspace; the maximum pre-built size is 7’ x 48”; however, there is time for the artist to complete – or assemble – the work within artspace. 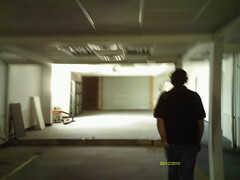 The ceiling is 14’ tall and the building is 40’ wide. There are two walls, each with 75 linear feet of space; there are portable walls that each measure 3’8” wide x 8’ high. b. Type: All forms of painting, prints, sculpture, fashion, mechanical, and installations that engage public participation. c. Style: No specific “style” has been set. The overall “feel” of the exhibit should be fun, pop-y, and interactive. d. Bubble wrap will be provided to each artist. Other supplies are the responsibility of the artist. a. Total Fee: $500 + Bubble Wrap supplied to artist(s). All other materials are the responsibility and expense of the artist(s). Pushing Hands, Eat Drink Man Woman, and The Wedding Banquet, all colorful, acclaimed films by Ang Lee, will be aired @ RFC April 5-9. It's the result of a conge' between the Taipei Economic and Cultural Office in Houston, the Centenary Film Society and The Robinson Film Center of Louisiana. Admission to all films is free, exclaims Chris Jay. Plan to attend a free community reception with Taiwanese consulate Mr. T.K. Lee on Wednesday, April 7 at 5:00 PM. To attend, please RSVP to (318) 459-4122.